I have been a fan of the voice and music of Hamburg’s Miriam “Mimi” Schell since first hearing her on the 2001 Force of Gravity album from German band Sylvan where she sang Midnight Sun an absolutely spectacular duet with Marco Glühmann. Now, Mimi has returned to create her own first album, Heliodor. The album was produced by Ken Stringfellow (The Posies, R.E.M., Big Star) who also creates a wonderful dreamscape of music, playing all the instruments. The album was recorded throughout the world, in Paris, Tours, Hamburg, Hannover, Cologne. Rotterdam and Medford, U.S.A.
With a title derived from the Greek “gift of the sun” – a lemon-yellow gemstone – Mimi describes Heliodor as a concept album about “love and all its various facets: romantic, dangerous, fragile, rebellious, utopian, twisted, universal and eternal… The love for each other and the love within us. The album title appeared to me in my dreams. This album, which so many people believed in and worked on, now really seems like a manifestation of the sun’s gift to me”. Heliodor is the most unique album release you will witness this or any year. It comes to you in the shape of a handcrafted book scroll. When completely unrolled, the work of art is ten meters long. It is the world’s longest and probably most unusual record cover. The music itself is enclosed in a personal download code that comes with each hand numbered and signed book scroll. 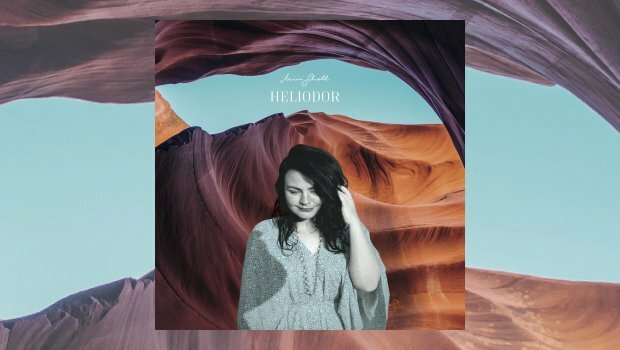 This Love Is a Monster boldly opens Heliodor, with jarring drums and symphonic splendour, before Mimi’s country sounding voice sings, “I would do it again”, despite the difficulties love sometimes brings. This is a powerful opening song about living life and love to its fullest. Don’t hold back let it flow. A great kick off track. Drawn to Your Light sounds like a spring or summer song, perfect for being down by the lake or the ocean. It really takes another step up when Mimi changes tempo and harmony and sings, “Some people falter, afraid to alter. Waiting for a moment in time”, full of more emotional feeling than most songs I have heard, the sound taking me back to classic music I remember from my youth. I think Mimi is saying, don’t wait. Make it happen when the fire is there. Don’t be afraid to express your love. Passing the Monuments is a regal inspiration, full of deep keyboards and electronic wizardry. Mimi’s lyrics do an excellent job of describing the need for more communication and understanding, especially as big moments of life’s important episodes pass us by, like a ride on a train. The world moves past and we need to take notice and enjoy every moment. The “It’s breaktime” pause is a nice reflective moment to help emphasise the importance of the lyrics. Why So Afraid is a country stomper, full of charm and grind. Mimi sings, “Gotta learn to be patient. In a wide-open space. Gotta learn to be playful. It will turn out your way.” Slow down and stop for a moment in the fast paced world we all live in. Shiny Boxes is slower paced, acoustic and electric guitars driving the mood, supported well with orchestrated strings and a magnificent surrounding soundscape. Another of my favourites, Schell’s vocals and lyrics are perfect on this track. Can You Feel It is an optimistic look at a world coming together. The Jackson’s penned this great song years ago, and it stuck well with Mimi as it has with many since. This is another anthemic song of unity we all need. Powerful, like some of the great unity songs we all remember from the 1960s. We don’t have to wait for God’s Reply. Learning to live beyond and despite material things. A great message delivered with inspirational music. The acoustic closer, The Tower, is another wonderful and inspirational song. An almost Blackbird rhythm opens the track with acoustic guitar and Mimi singing, describing an ethereal place. “Heaven reveal your love, there is still hope on this Earth. Full of wonders”. Thank you, Mimi. This is Mimi’s masterpiece, and she is sharing it with all of you. Some people wait a lifetime to create their masterpiece. The scroll is written with care and love and the illustrations within provide a vision of a life fulfilled, even at such an early age. I am finishing this review on Mimi’s birthday. Please get this for her… and for you. The inspiring music within, and the illustrations provided in the scroll, will give you something to reflect on all this hopeful new year.